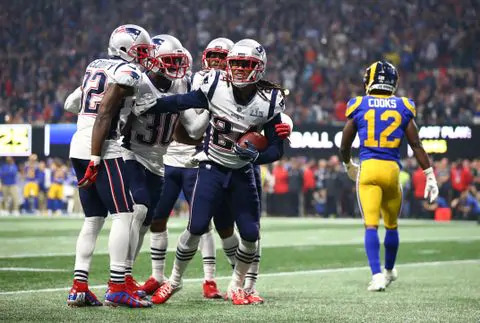 New England topped the Los Angeles Rams 13-3 in a game that dragged the high-def NFL back to the days of black-and-white TV. It was the lowest-scoring Super Bowl in the 53-year history of the game. New England added even more luster to the franchise’s rich championship history on Sunday night. New England is now tied with Pittsburgh at six Super Bowl titles apiece and also improved to 41-1 in the Bill Belichick-Tom Brady era after shutting out an opponent in the first half, including the postseason. Brady is also the oldest quarterback to win a Super Bowl at age 41. Belichick is the oldest coach to hoist the Lombardi Trophy at age 66. Julian Edelman caught 10 passes for 141 yards; he was the day’s only consistent offensive threat making him the Super Bowl MVP. But the real stars of this game were the New England defenders, who smothered Rams quarterback Jared Goff, holding him to 229 yards that felt like less. Their goal was to get to the young QB, and they did more than that as at times he would seem clueless. With Brady adding his sixth Super Bowl to his resume, he intends to play the 2020 season. This would be Brady’s 20th season and he will be 42 years old. As for the Rams, the young core of Sean McVay, Jared Goff, and Todd Gurley have set the foundation for LA in the future years and they look improve over the offseason.